I have already shared the list of heritage sites to explore in Ahmedabad in my previous article, but Ahmedabad is not only about heritage site. 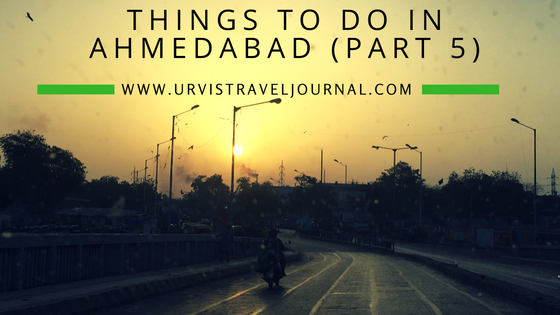 It offers plenty of spots for shopping, dining, Sabarmati river as well as bird centuries. The Sabarmati Riverfront is the latest development and one of the famous attraction among the localities. The Sabarmati river flows North-South and divides the city in East-West. The Riverfront extends up to a length of 11.25 kilometers on each side. The best time to explore this place is either early morning or around sunset time. This can be a perfect spot to start your day. Besides Riverfront, there are two other lakes where you can find morning joggers and evening lovers hanging around. The Kankaria lake has a lot to do so if you are planning to visit all attractions then spare at least a day. If its a weekend, then the much more crowd will be there, including tourists and localities. Some fun things which I loved are Tree walk, Balloon Safari, Nagina Wadi, Mirror maze and Mini train. Kankaria will be definitely a fun place for kids. It has an amusement park and zoo as well. I love watching birds, especially when they fly high. It gives the message of “freedom to fly”. If you are also fond of watching birds, then Thol Lake is the place to be. Thol Lake is around 30 kilometers away from the Ahmedabad city depending on from where you are traveling. This is a great picnic spot as well, I saw many people bring picnic gears and enjoying their outing. This bird century consists of little less than 6 km Lakeshore. I had planned to hike at least 3 km, So I was ready with my hiking gears. I would suggest you carry a small bag pack with water, snacks and energy drinks. I didn’t see any shops around so better to carry everything with you. The Nal sarover bird century is also another place for bird watching, which is almost 2 hours drive. I didn’t have enough time, so couldn’t visit it. I have visited this place with my friends and it was so much fun. You need to spare a whole day for it. If you love science then you will fall in love with this place. It has an Imax 3D theater, which was one of the reasons, I was excited to visit. The Science City is divided into mainly 11 parts :- Imax 3D theater, Hall of Space, Hall of Science, LED screen, Energy Education Park, Life Science Park, Musical Dancing Fountain, Amphitheater, Planet Earth, Electrodrome, and Thrill ride. Among all the attractions I love Energy Education Park, planet Earth, and Thrill Ride. I had never seen such a huge Earth Planet ever. You go for a shopping in the mall is very common nowadays, but street shopping is much more fun. Ahmedabad is famous for street food and shopping. In the daytime, all shops are open in Manek Chowk and you can buy local stuff from there. For shopping in Manek Chowk, you should be having a good bargain skill. Manek Chowk is the best place to have street food. Although you think it’s not healthy, but you will not find that taste anywhere else. These food stalls are open till late night. Don’t forget to try Chocolate sandwich, heaven for chocolate lovers. There is one more area known as law garden, where you can buy traditional clothes. The Law garden is famous for buying Chaniya Choli and oxidize jewellery. Read this story from beginning.